This PDF 1.5 document has been generated by PScript5.dll Version 5.2.2 / Acrobat Distiller 9.4.6 (Windows); modified using iText 2.1.7 by 1T3XT, and has been sent on pdf-archive.com on 02/08/2012 at 23:56, from IP address 24.253.x.x. The current document download page has been viewed 568 times. File size: 91 KB (13 pages). 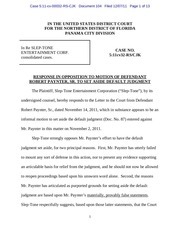 Mr. Paynter in this matter on November 2, 2011.
judgment are based upon Mr. Paynter’s materially, provably false statements. for making those false statements. liability for his clear and intentional acts of infringement. 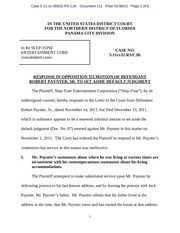 the Plaintiff’s contact with Mr. Paynter. Exhibit 3 thereto.) The settlement letter requested a response within 10 days. for “one party” consent to recording, whether such an announcement is made or not. proposal to Mr. Paynter at his confirmed email address, callbigbob@comcast.net. federal law governing the recording of telephone calls, which requires only one party’s consent. Security of Communications Act. See Fla. Stat. § 934.02; Royal Health Care Services, Inc. v.
Jefferson-Pilot Life Ins. Co., 924 F.2d 215, 217 (11th Cir. 1991). a partnership in which he is a general partner, indicating service at the same time. reports service upon Jack Paynter, but expressly identifies him as the father of Mr.
2011. This statement is also false. 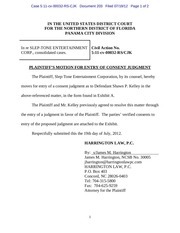 Around the time the lawsuit was filed, Mr.
there, and accepted substituted service of process. a ruling was made against me. judgment could hardly have been the surprise that Mr. Paynter makes it out to be. investigated by the Court in order to safeguard the integrity of the judicial process. matter with the seriousness it demands. reflect contempt for this Court and its proceedings. It is bad enough that Mr.
decided. The Court should punish, not reward, this behavior. for setting aside the default judgment. filings, even though he is ultimately bound to follow all of the applicable rules. 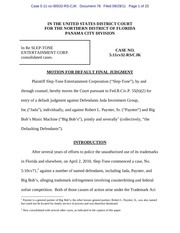 See GJR Invs., Inc. v. County of Escambia, Fla., 132 F.3d 1359, 1369 (11th Cir. benefit of a legal education”). motion are newly-discovered evidence or manifest errors of law or fact.” Arthur v.
letter cannot serve as a proper, grantable Rule 59(e) motion. 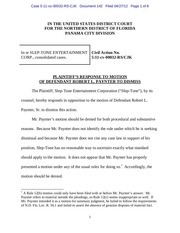 With regard to Rule 60(b), Mr. Paynter’s letter is likewise deficient. 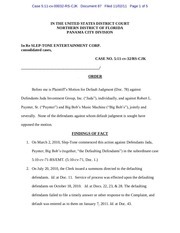 Mr.
F.3d 1277, 1287 (11th Cir. 2000). factual record before the Court as described above. other misconduct by Slep-Tone as grounds for needing the extension of time. attempt to bring this matter to a conclusion. requires that Mr. Paynter’s motion be denied. Respectfully submitted this the 7th day of December, 2011. This file has been shared by a user of PDF Archive. Document ID: 00042955.